Copper pipe plumbing is the choice of many commercial businesses and home owners. Copper piping has a number of benefits over some alternative materials including galvanized steel, PVC and PEX piping. It is estimated that approximately 80% of home owners and commercial businesses in the U.S. use copper pipes for their overall plumbing. Our plumbers have the experience to help aid you in decisions of what would be the most durable and cost efficient piping for all of your plumbing needs. Get in touch, for a quick estimate for your copper piping installation, replacement, or repair services! Call Perry Aire Plumbing at 703-521-2228 for copper piping installation and repair services in Arlington Virginia, Washington DC and Maryland! Easy installation: Copper is a very soft metal, so it can bend rather easily. Therefore, copper pipes can be installed using less fasteners and connectors. Since less hardware is being used, it will be easier to install this type of plumbing. Cleanliness: Bacteria can grow in other types of plumbing, especially plastic piping designs. Bacteria cannot grow in copper pipes. Also, there is no risk of lead poisoning as lead isn’t used during the manufacturing process of copper pipes. Durability: Copper pipes are very durable. Unlike designs that are made of steel, copper pipes will resist corrosion effectively. They are also capable of withstanding ultraviolet rays unlike copper piping plastic designs. These characteristics help make copper pipe plumbing ideal for outside uses for utilities like sprinkler systems. 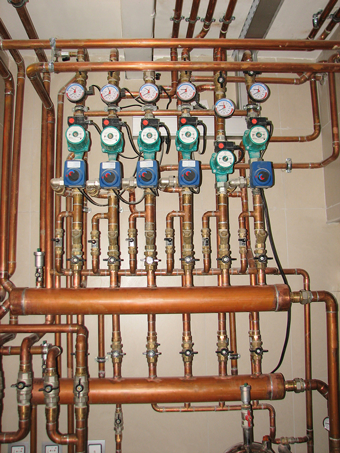 Temperature resistant: Copper piping for plumbing works great as it resists temperature changes very well. If a fire were to occur in your home or business, toxic gases will be released if you have CPVC piping, or plastic pipes. Copper pipes don’t burn, so they won’t release toxic gases. Why should you call Perry Aire Plumbing for copper piping installation services?